13-year-old Sainamere loves to cook and spends her mornings in one of our local education centres doing just that. 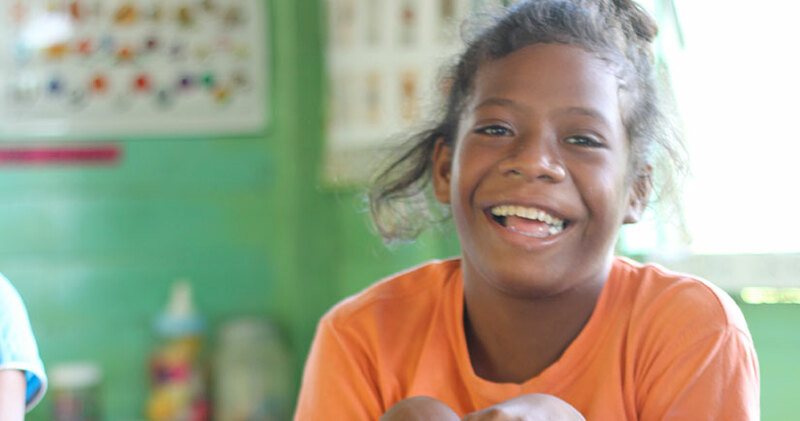 Sainamere is a special needs student but getting access to a specialised school is too difficult due to the travelling distance between her village the local town. The Kindergarten Centre in her community was established as part of Save the Children Fiji’s Vuli Taumada Shishak programme which has helped created more than 50 centres across Fiji in the last 3 years. Sainamere’s kindergarten is a short walk from her home and her local teacher Filomena said her team helps by bringing her to the centre with them each day. Sainamere loves playing and creating imaginary food with her classmates in the preschool and teachers say she is happier when she comes to the centre regularly. Save the Children Fiji’s District Coordinator, Mere Krishna, said giving Sainamere education shows the commitment by the local community to break the barriers of access to education for every child. “These circumstances aren’t ideal but they at least provide some form of education to a child that would be left without any, purely because of the area she was born in,” she said.